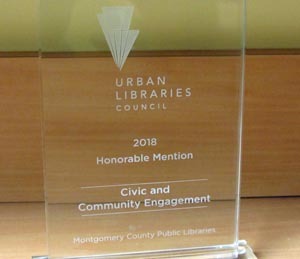 MCPL was named a 2018 Top Innovator Honorable Mention in the Civic and Community Engagement category from the Urban Libraries Council (ULC) for the Reading and Educating to Advance Lives: REAL Change program! The REAL Program, coordinated by the Jewish Council for the Aging’s Heyman Interages® Center, the Montgomery County Department of Health and Human Services (HHS), and MCPL, helps children and families make good use of time while waiting for HHS services at four County offices. It provides community book collec­tions, information resources on literacy and healthy habit development for caregivers; and guidance on using the public library. Read about MCPL's new initiatives and programs as covered by local and national media. We are excited to serve the entire Montgomery County community. 2017 NACo Achievement Award: What Do I Check Out Next?